Since I got back from South America the weather has been arctic and I’m not going to lie, it’s been a pretty unpleasant transition. So how, as a personal trainer who works outside and sometimes works out before the sun rises, do I keep warm? 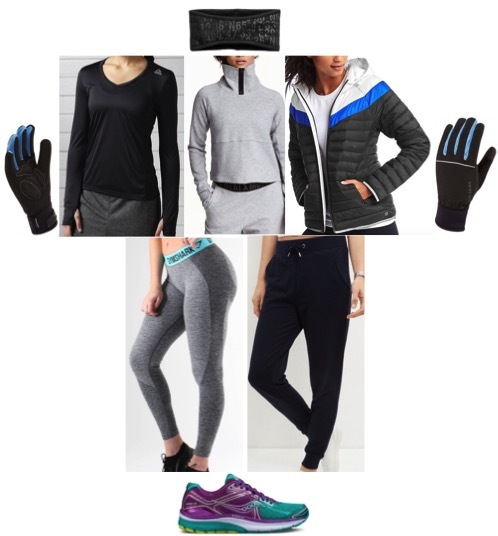 This is my ultimate list of winter fitness kit to keep you warm and keep you moving. It’s easy to spend a fortune on fitness kit, especially in the winter with all of the ‘heat tech’ but I don’t have a fortune so everything I buy has to be good value and affordable. Some of these items I own and use on a regular basis, the others I just want in my wardrobe! I’m a sucker for a grey sweatshirt and this is a good one. I don’t have this but I love the high neck as it looks a bit like the Nike tech fleece but for a fraction of the price. When I’m teaching outside I don’t like to be too bulked up with a big jacket so this light puffa jacket is the perfect layer. It still allows me to demonstrate exercises to my clients so they can see what my body is doing while keeping me warm. It’s currently on sale, get it before it goes! A basic pair of trackies worn over a pair of workout leggings seem to do the trick at keeping out the worst of the cold so while I don’t actually own these I do have a similar pair. My trousers tend to get filthy when I’m working outside so something cheap and dark is best. The worst bit about cycling or exercising outside is your hands getting so cold that you can’t actually grip anything. These gloves, although expensive out of the sale, are the best gloves I’ve ever had. I got them as a present (thanks Mum!) and they keep my hands warm even when I’m cycling into icy rain. This isn’t a sponsored post by any of these brands, these are all products that I either bought myself and love or would like to have in my fit kit wardrobe.